The Williams typewriter is known mostly for its grasshopper mechanism. The type bars are placed on either side of the platen, and jump in from either side when keys is hit, creating not just the illusion of a grasshopper movement, but of a cloud of grasshoppers if you type fast enough. (pic 6). The Williams was a design by John Newton Williams, based on an earlier invention, and put on the market by the Brady Manufacturing Company of Brooklyn in 1891 (Brady also produced the Fitch which explains several similarties). 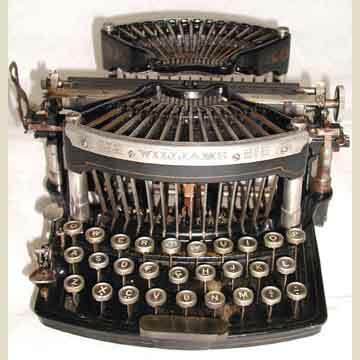 The early Williams 1, presented here, had a slightly curved keyboard with three rows of keys. The Williams 1 was nicely decorated on all sides. The Williams shares two early patent dates with the Fitch typewriter, both relating to basic techniques, such as the shift key, the patents for which at the time were still owned by Remington. The paper was fed into the Williams from a paper basket in front of the platen. It went over the platen and down into a second paper basket behind it. The result was a machine with visible writing, at least for the sentence one was working on. For more details see the book â€œTypewriterâ€�, page 100.